Does the Koran contain marvels of mathematics? Jesus-Islam » The Koran » Does the Koran contain marvels of mathematics? Does the Koran contain things only God could know? Many Muslims argue that the Koran contains mathematical wonders that could only be authored by God Himself. An example of these mathematical wonders is numerical parallelism. For instance: the word month appears twelve times in the Koran, the word day appears 365 times, the words man and woman appear an equal number of times. Similarly the words Angel and Satan appear an equal number of times. Finally, the expressions this world and the other world, also appear an equal number of times. Such numerical parallelism, it is argued, could only be the result of a Divine Spirit as the author of the text. In addition to these recurring numerical patterns, it is said that there is a hidden code in the Koran. That chapter also contains a total number of words which is divisible by nineteen. Dozens of examples of this kind can be found, but the nineteen number is not the smallest of the prime numbers, which makes very unlikely the appearance of this numeric pattern in a text, they say. They affirm that the presence of this Koranic verse concerning the number nineteen, the scarcity of numbers, and the prevalence of the numerical motif, we can trust that Allah is the author of the text. ANSWER: IN WHAT MANNER IS THIS NUMBER SPECIFIC? Although many Muslims find the argument compelling, this has never been true in my case. All kinds of amazing digital patterns can be found in the world around us, just look for them. If you search hard, and if you choose you what you are looking for in the first place, you will find such many such digital patterns. How did he find these numbers? We know that is exactly what the person who “discovered” the numerical motif nineteen in the Qur’an did. He searched for them and had already decided what he wanted to find. It took Rashad Khalifa, who published a text on this pattern, about 250 pages to argue that the number nineteen was found in fifty-two different forms in the text of the Koran! 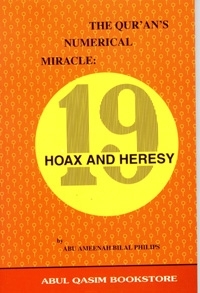 However, even some Muslims have criticized the argument concerning the prevelance of the number nineteen, highlighting significant major flaws found in Khalifa’s reasoning. Philips himself wrote a whole treatise against him entitled THE QURANS NUMERICAL MIRACLE – HOAX OR HERESY. He refutes all these absurdities, and proves, with proofs, that the figures given by Dr. Khalifah are far from reality. Philips declares: “The theory of the nineteen is a badly conceived hoax and incapable of resisting a serious scientific examination. Part of Philips’ response to Khalifa refers to the verse that Khalifa quotes, 74.30-31. Reading the entire text, in the case that concerns us, indicates that the number nineteen refers to the number of angels watching over the fire of hell, not miraculous numerical patterns that would be in the text of the Koran. Just as we have seen others do with Koranic “prophecies”, Khalifa simply pulled the words out of context and tried to adapt them to his theory. Another part of Philips’ response concerns the inconsistent method and arbitrary selections in the texts used to argue in favour of the nineteen number. “Using Dr. Khalifa’s inconsistent method of concocting multiples,” says Philips, “it is also possible to establish the number 8 as the axis of the miraculous numerical code of the Koran” , and he continues by giving eight reasons. Most of Philips’ replies to Khalifa’s argument are a systematic analysis of his publications and calculations, and concludes that Khalifa “fabricated some data artificially to create totals of letters that are multiple of nineteen”. Not only does Khalifa make an inconsistent account of letters and verses, according to “a random system of word identification that totally contradicts the classical and modern rules of Arabic grammar,” but he goes so far as to reject two verses from the Koran in order to allow its calculations to function. Philips’ arguments against Miraculous “digital patterns” are convincing, as is his conclusion that Khalifa was willing to modify the Koranic text simply to make the data usable. Similarly, the argument in favour of “wonderful numerical parallels” seems to treat the text inconsistently and to alter it the precise words in the Koran. For example, the Koran does not use the word day 365 times. It uses it 360 times, and for five other occurrences to be countable, proponents of the argument are forced to tamper with the data in order to allow words that are not exactly the word day to be counted. The same applies to the number of occurrences of the word month, as are the occurrences that are supposed to be parallel to the words man / woman and this world / the other world. Since Arabic is a Semitic language and uses a triliteral root system, different words are very similar in their spelling. This fact of grammar is often used by those willing to manipulate the data to make their arguments appear credible and convincing. To those with any knowledge of the Koran in its original, the evidence is that these number patterns are imposed on the text rather than derived from it.